We've seen numerous counter-productive consequences of Obama's Cuba policy on the island: a dramatic rise in repression; a new refugee crisis; tenfold rise in religious persecution; plummeting U.S. agricultural sales; and the strengthening of Castro's military monopolies. In the last couple of weeks, we've also seen how Venezuela's regime is making a mockery of the Inter-American Democratic Charter and -- despite the best efforts of OAS Secretary General Luis Almagro -- the region's tragic ambivalence to defending democracy. Yet another consequence of Obama's short-sighted Cuba policy, which we predicted (below) from Day One. The recent political witch-hunt against famed Venezuelan opposition legislator Maria Corina Machado reinforces growing concerns that democratic institutions are under concerted attack in the Western Hemisphere. “Justice is on its knees in Venezuela with sentences being dictated from Miraflores or Havana,” Machado says, summing up the political alliance between Cuba and Venezuela’s governments that drive her country’s politics. She stands accused of conspiring to kill Venezuela’s President Nicolas Maduro. Another opposition leader, Leopoldo Lopez, has already been imprisoned. Through its cohorts and directly, Cuba has been pounding democratic institutions not only in Venezuela, but also Bolivia, Ecuador and Nicaragua. Democracy’s advocates in the region are too shortsighted, beleaguered or intimidated to fight back aggressively. In fact, they invited Cuba to participate in the upcoming Summit of the Americas in Panama, despite the fact that Cuba’s Castro dictatorship openly scorns the “democracy clause” that reserves Summit membership and participation to the region’s democratic governments. Thirty-four of the 35 nations comprising the Western Hemisphere adopted that clause during the Quebec Summit. Cuba was then and still is the Hemisphere’s last remaining totalitarian state; it also has a long history of “exporting revolution” into democratic states. 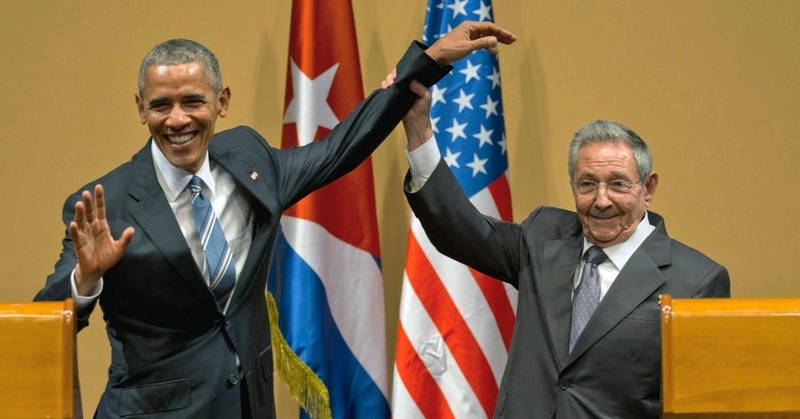 The Obama Administration initially stated its opposition to Cuba being invited to the Summit. However, in a turn-around announcement on December 17, it chose to “lead from behind” and acquiesce to the whims of those hemispheric leaders all-too-eager and willing to suspend the “democracy clause.” Not only has President Obama now accepted Cuba’s participation, but he will also be there to personally welcome dictator Raul Castro. However, those who lobbied Obama to attend the Summit regardless of the violation of the “democracy clause” weren’t to be satisfied with his attendance alone. They also wanted the President to arrive with a gift bag for Cuba that includes a further lifting of U.S. sanctions. That, they argued, will ensure a warm reception for Obama from “troubled” Latin American leaders. And naturally, Castro would be thrilled. If this sounds familiar, it’s because the exact same arguments were made in the months and weeks leading up to the 2009 Summit of the Americas in Trinidad. Just days before that summit, the Obama Administration did ease sanctions against Cuba. Despite this “gesture,” Obama was not received in Trinidad as a hero. He was treated as a pushover. Then Venezuelan leader Hugo Chavez even engineered a photo-op with the President that featured copies of anti-American book, Open Veins of Latin America. Latin America’s “extreme Left” considers the book to be its bible. (The author, Eduardo Galeano, has recently disavowed his creation.) A few months after that summit, the Cuban government of Raul Castro seized an American hostage, Alan Gross, in a successful effort to coerce the United States into releasing a group of imprisoned Cuban spies. For months, advocates for lifting sanctions used the Panama Summit as a prop in their campaign against what they call the United States’ “failed policy.” They would happily sacrifice our national interest in regional democracy to advance their narrow agenda. Not only is this dangerous and irresponsible, it also begs the serious question: What do they consider to be a “successful” policy alternative? Is it the “China model,” whereby U.S. business helps to build the most lucrative dictatorship in human history? A “Vietnam model” of state capitalism under an iron-fisted rule? A “Burma model,” whereby reforms achieved through pressure are rolled back as soon as sanctions are lifted? Raul Castro, Nicolas Maduro and their puppets revel in such models. But none should have a place — geographically or politically — in the Western Hemisphere. In this hemisphere, every nation (except Cuba) made a commitment to representative democracy in 2001. It was a historic commitment that, backed by the United States, has blocked the authoritarian ambitions of wannabe dictators in Latin America and generated continued support for democracy and civil society. It was a commitment that Obama’s December 17 announcement has now placed on the chopping block.